Commuters have been waiting years for new Bronx Metro-North stations in the Bronx, but an analysis by Norwood News editor David Cruz in City & State New York says that reaching the pot of gold at the end of the tracks might not be so simple. To begin with there are doubts about how many riders will be able to afford to ride the line. 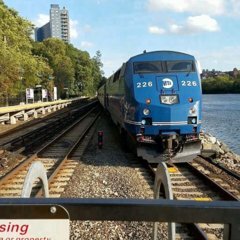 New York City Comptroller Scott Stringer said that Metro-North’s ticket costs would need to be reduced in order for it to be a success. Also, the piece points out that further infrastructure work will be required to create the connectors to Penn Station. The tab on that work is estimated to be as high as $11 billion and the work won’t be completed until 2022. Additionally, though the agreement between Metro North and Amtrak was recently signed, there is some concern that further conflicts could emerge. The new stations are to be built in the existing Amtrak tracks in Co-op City, Morris Park, Parkchester and Hunts Point. Creating these new stations will make a smoother commute since it’s already difficult to stand during the morning and evening rush hour on the Metro-North’s New Haven Line and subway system. PSA was never intended for Bronx commuters to get access to Penn, it's meant to bring them to Connecticut. As much as I would love cheaper in-city fares I wouldn't hold my breath.